This page features a free printable Map Of South Carolina. 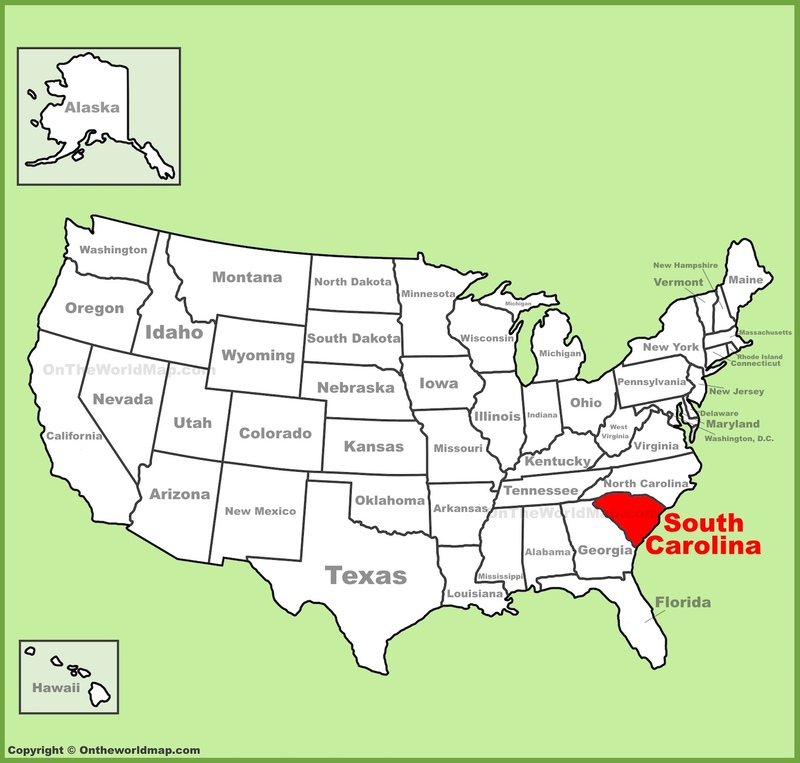 The above US map shows the location of the state of South Carolina in relation to other US states. On May 23rd of 1788, South Carolina became the 8th of 50 states admitted to the Union, as one of the original 13 colonies. Scroll down to find fascinating facts about the state of South Carolina. The highest point in South Carolina is the summit of Sassafras Mountain, measuring 3,560 feet above sea level. The smallest town in South Carolina is Smyrna, with a land area of less than one square mile and a population of around 45. Despite its tiny size, Smyrna is home to a town park, a general store, an electronics store, at least 4 churches, and a post office. Charleston, South Carolina is home to more than 400 churches, with many denominations represented. The Civil War began at Fort Sumter, South Carolina on April 12th of 1861. Bishopville, South Carolina is home to the Button Museum. Morgan Island is home to more than 4,000 rhesus monkeys, which are used for AIDS research and other scientific testing. Tattooing was illegal in the state of South Carolina until 2004. South Carolina is the only state in America where tea is grown. Famous people from South Carolina include Blackbeard, Chubby Checker, and Dizzy Gillespie, among others. Native American tribes from South Carolina include the Catawba, Cherokee, and Yamassee people, among others. Above: A Map Of South Carolina showing cities, roadways, commercial airports, and surrounding states.